We’re delighted to be working with Kevin Morby once again! Singing Saw is a record written simply and realised orchestrally. In it, Kevin Morby faces the reality that true beauty – deep and earned – demands a whole-world balance that includes our darker sides. It is a record of duality, one that marks another stage of growth for this young, gifted songwriter with a kind face and a complicated mind. 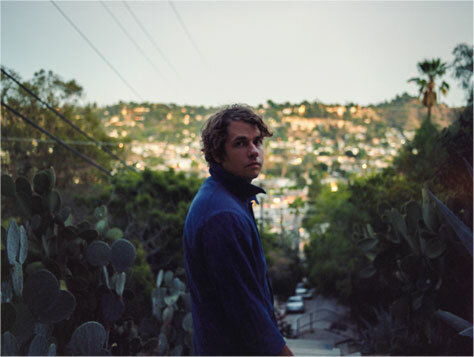 In the autumn of 2014, Kevin Morby moved to the small Los Angeles neighbourhood of Mount Washington. The move would shape Singing Saw, Morby’s first album for new label Dead Oceans. Previous tenants at Morby’s new home happened to leave an upright piano behind, with a few mysterious pieces of sheet music and an introductory book of common chords stacked on top. Thankful to finally be in one place for an extended spell, Morby, a beginner at the piano, immediately sat at the new instrument and began composing the songs that would form Singing Saw. Alongside, he began taking long walks through the winding hills and side streets of the neighbourhood each night, glimpsing views of both the skyline’s sweeping lights and the dark, dried out underbrush of the LA flora. The duality of the city itself began to shape a set of lyrical ideas that he would refine with the sparse accompaniment of piano and acoustic guitar. What is a singing saw? It is an instrument that creates ethereal sounds, but it is also a tool: basic and practical while also being fearsome, even destructive. Morby watches the singing saw in its eponymous song; that instrument of eerie soft beauty cuts down the flowers in its path and chases after him, while his surroundings mock and dwarf him, Alice in Wonderland style. And in a singing saw, we can understand music as something more powerful than its inviting, delicate sound. No wonder Morby talks about a ‘songbook’ in his head as something he needs to take up the hills so he can ‘get rid of it’. Heavy themes are nothing new for Morby, whose previous records (2013’s Harlem River and 2014’s Still Life, both released on the Woodsist label) dealt with their own eerie visions and damning prophecies. The arrangements of Singing Saw trace back to Morby’s experience playing in The Complete Last Waltz, a live recreation of The Band’s legendary last performance. There, Morby developed a fast friendship with producer/bandleader Sam Cohen (Apollo Sunshine, Yellow Birds), which led Morby to forgo recording in Los Angeles and take the nascent songs of Singing Saw to Isokon Studios in Woodstock, New York. There, in a converted A-frame house, they set about creating a record that would bring a sonic balance, intricacy and depth to match these songs and all that inspired them. Sam Cohen added a multitude of instrumentation to the record (guitar, bass, drums and keyboard), and were joined by fellow Complete Last Waltz alum Marco Benevento on piano and keyboard, fleshing out Morby’s original compositions and upholding the vision for a cohesive piano sound that serves as a touchstone for the entire album. Backup vocalists Hannah Cohen, Lauren Balthrop and Alecia Chakor contribute soaring harmonies; Nick Kinsey (Elvis Perkins) adds drums and percussion; Justin Sullivan, a longtime Morby collaborator and staple of his live band, contributes drums; Oliver Hill and Eliza Bag lift numerous songs with string accompaniments, and Alec Spiegelman on saxophone and flute and Cole Kamen-Green on trumpet bring dramatic swells. Finally, John Andrews (Quilt) adds the eerie lilt of the album’s promise, providing saw on the Cut Me Down and Singing Saw. Tour support comes from Jess Williamson. Jess Williamson is a musician and photographer based in Austin, TX. She self-released her debut EP, Medicine Wheel/Death Songs, in 2011. A small cassette only label called Wild Tan released a limited run of cassettes of the EP. In 2014, she released her first vinyl record, Native State, on her own imprint, Brutal Honest, followed by a split seven-inch with RF Shannon via Punctum Records later that year. This show is a co-promotion with Now Wave and Comfortable On A Tightrope. Buy tickets now. Tickets are available from Piccadilly Records, Vinyl Exchange, WeGotTickets.com, Ticketline.co.uk and on 0871 220 0260.